Sharing day-to-day happenings and updates with Learners has never been easier! With our new mobile app update, you can reach out to all your students with just a couple of screen taps. What’s different? Read on to know more. Earlier, on the Communication page, you could see separate buttons for message, album and post. We’ve unified these three into a single blue ‘Post’ icon on the bottom right of the screen. Tapping on the Post icon will take you to the Add Post page. We’ve removed sections like Title and Tags and kept only the important stuff to make communicating with your Learners via mobile as simple as possible. Towards the lower half of the screen, you will find buttons to add attachments, albums, templates or users and to schedule posts. Once you are done, tap the ‘tick mark’ on the top right corner to send your post. To change course, tap on the edit icon besides the name of the current course selection. That’s easy, isn’t it? 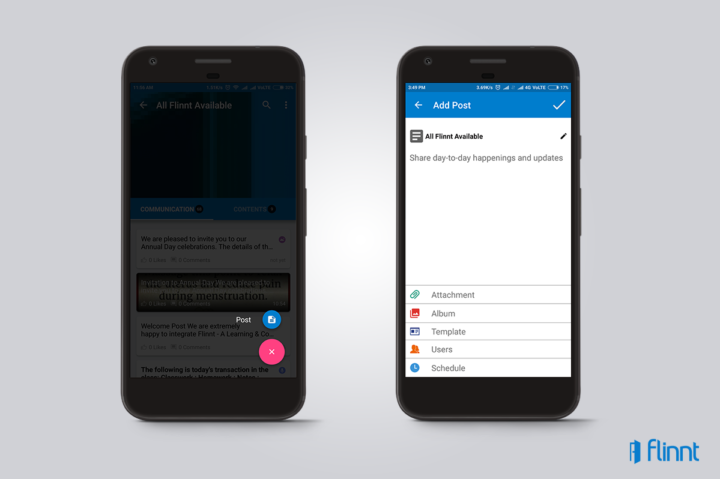 If you’ve always put off adding posts via the mobile app because you found it to be complicated, you’re sure to love these changes. Update the Flinnt app right away, check it out and let us know how you like it!